Just like the holidays come and go, Spring will be here before you know it. By following the four tips below, you’ll be sure to have a greener, happier New Year! Now is the time to inspect your sprinkler system, finding and removing any clogs, deposits or leaks. 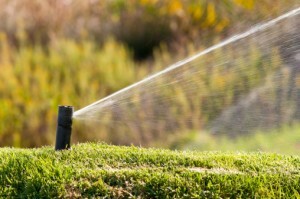 Now is the time to inspect your irrigation system for proper operation. It is much cooler and the lawn does not need to be watered as much. So take the time to pop up each zone and see if the sprinklers are working correctly and covering the entire lawn. Check the landscape beds to ensure the drip system is not clogged up. If you have a well the water can be very hard and clog the drip lines — even the filters in the sprinklers. The dry season is just around the corner and our lawns will be under a lot of stress until our rainy season comes. So take the time now to get your system up and running. If you need an irrigation company to do this, please give us a call and we can recommend a good one. We’ll even call them for you to set up an appointment. If you are planning to re-landscape some areas or move some trees or plants to different areas around your home now is the time. It is cool and will not be so hard (transplant shock) on the plants. If you need a landscaper to help, do the work, or just consult, just give us a call. We have several landscapers that we highly recommend and we can even set up the appointment. Winter is the perfect time to plan for re-sodding your lawn, before the summer rush. I know some of you are probably wanting to add more sod or even re-sod some areas. Now is the time to plan, not install yet but put a plan together. Different areas require different types of sod depending on use (in example, shady areas and play areas.) If you need help in planning what type of grass to plant in which part of your yard, please give us a call. One of our service reps will come out and help you put a plan together. When the summer comes sod sales go through the roof. 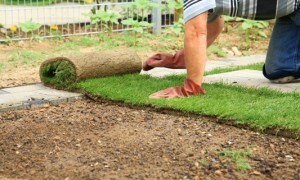 Plan now and get you sod job planned and your sod ordered before the rush. Get to know your lawn and landscape. Take a few minutes every week and inspect your yard. By taking the time and looking around every now and then, you will notice things such as insects, disease, and watering problems. By doing this you can catch things in the early stages and call us, so we can start the correction process. We are on your property on a monthly to semi-monthly basis. A lot can happen in between that time. If you can’t do this for whatever reason, have your landscaper, mowing person or even the pool guy call us. Communication is key and will and can save your lawn and landscape. So rather than give into the winter blues, take a few moments and think of all the ways you can prepare your yard and lawn for a cheerier and happier New Year!